Fun fact: I despise grocery shopping. The overwhelming barrage of boxes on display and bustling aisles gives me stimulation overload. Also, why are things never in the right place? Last week, I needed some sundried tomatoes and was forced to go to a grocery store I rarely shop at. I searched near the fresh tomatoes, canned tomatoes, and pasta area only to come up empty handed. I finally caved and asked an employee. He had no idea where they were either. After ten minutes of searching, we found them located by the nuts and seeds. Why? I still don’t know. The one store I don’t mind shopping at, however, is Trader Joe’s. I feel like everything is perfectly placed in the right section. It’s small enough that I can pretty much grocery shop in about ten to fifteen minutes with my list in hand. 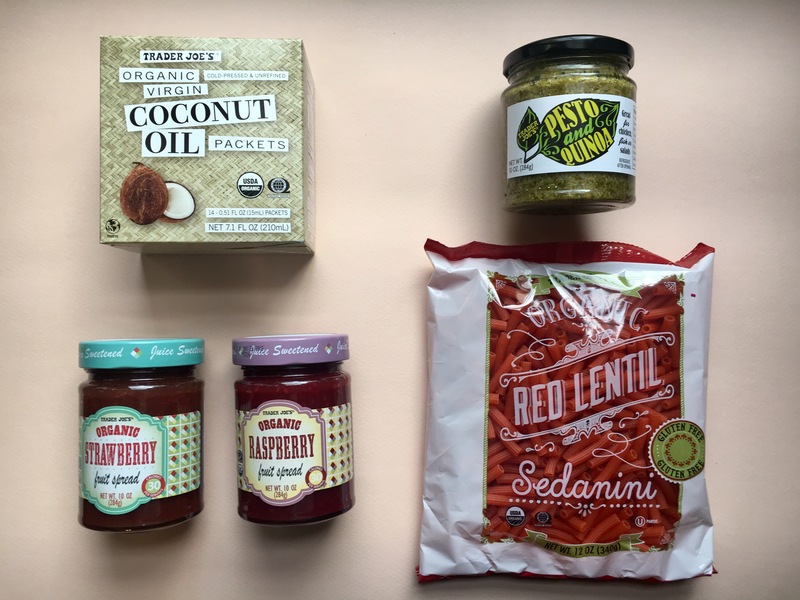 Plus, they have so many amazing products that are healthy, easy, and delicious for busy people on-the-go. Lentil Pasta – This lentil pasta just has one ingredient: lentils. It’s naturally gluten-free and tastes delicious. In fact, I think I like it better than the brown rice pasta. I tried the pasta with a traditional marinara as well as an olive oil, spice and veggie dish and both worked really well with the taste and texture of the pasta. Plus, with the boost of protein from the lentils, you will feel full, energized and sustained, unlike after eating traditional white pasta. Quinoa Pesto – Put pesto on anything and I will buy it! This mixture is great for whipping up a quick and easy meal in no time. You can incorporate it with proteins like fish, poultry, or tofu. You can even spread it on toast or crackers, mix with avocado, or toss in a salad. The quinoa provides extra protein to your dishes and can help you easily create a tasty meal without trying too hard. Perfect for those lazy kitchen days. Strawberry and Raspberry Fruit Spread – These preserves are the only ones I found that I can actually get behind. There is NO added table sugar because they are, instead, sweetened with apple concentrate. Plus, all the ingredients are organic. It’s a win-win. I love spreading this on a piece of toast with peanut butter or adding a tablespoon to a smoothie for an additional kick. For the best food-mood results, always try to eat the fruit spread with protein to ensure you don’t crash and burn. While it’s naturally sweetened, it is still sugar. 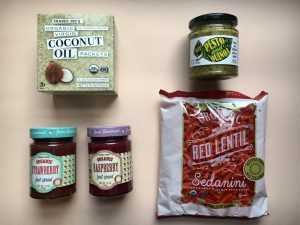 Coconut Oil Packets – A few years ago, I attempted to bring some coconut oil with me on my travels. I placed the oil in a tiny jar and sealed it tight. By the time I got to my hotel and opened my suitcase, nearly all my clothes were ruined with coconut oil stain. Avoid the mess and bring these travel packets instead. You can use them if you do oil pulling or even in your smoothie or on some toast. With the many amazing benefits of coconut oil, they will almost always come in handy when you travel.